These activities will help you learn how to write about past events in your life. 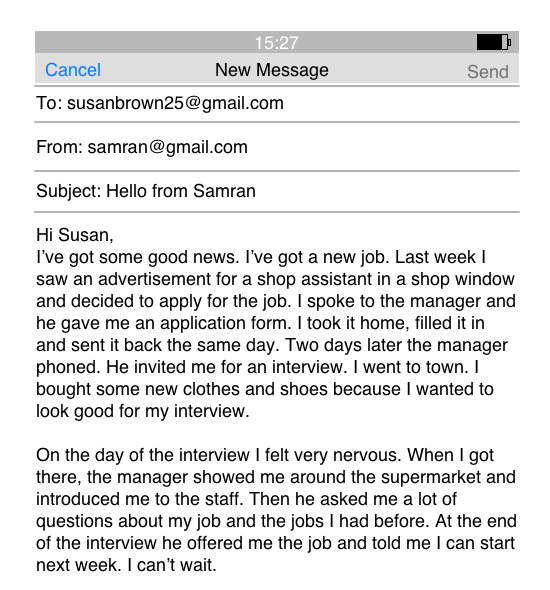 Samran wrote written an email to her friend to tell her about how she found a new job. Read Samran’s email and then complete the activities. Complete the sentences from Samran's email by typing the correct verb in the past tense. Thanks for your email. It was good to hear from you. I’ve got some good news. I’ve got a new job. Last week I saw an advertisement for a shop assistant in a shop window and decided to apply for the job. I spoke to the manager and he gave me an application form. I took it home, filled it in and sent it back the same day. Two days later the manager phoned. He invited me for an interview. I went to town. I bought some new clothes and shoes because I wanted to look good for my interview. On the day of the interview I felt very nervous. When I got there, the manager showed me around the supermarket and introduced me to the staff. Then he asked me a lot of questions about my job and the jobs I had before. At the end of the interview he offered me the job and told me I can start next week. I can’t wait. Write a story about something that happened to you. You could write about finding a job in the UK or something else that happened to you. Remember to use verbs in the past tense. the first job which i got in uk was in takeaway as chef. before this job i did not even know nothing about how to cook food in UK. But aftrer hard struggling i learnt how to make the pizza in pizza oven. Then after few month i got a lots offer from differnt takeaway by offering a good salery . Becasue i improved my self a lots to know UK's food cooking method . I came UK 5years ago.I got administrater job at travelling agency in first week. I worked there one year.My first I was very nervous but staff was good.My husband encouraged me a lot.In couple of days I learnt my all work.I really enjoyed my work. Recently I had been accepted to the IELTS exam. It's neccesary to my enrolling to the University I plan to enter. If I get 6 points I will be accepted to the University. However I already have predictions about my results.I hope that I doubt. Thank you Nazma. Did working there help improve your English? last Augest i went to visit my family in Turkey, i decided to drive my car from Syria up to my last destination. i went to Lebanon by road then i used the sea ship to reache Mersin i went through many cities on the way, i saw very wonderfull views. i spent 42 days then i returned back home ,it was so interesting experience . Hello there, first of all , I.would like to big thank you to ESOL Nexus to give opportunity to learn English in here. My first kob was as waitress in the pub . It was interesting job .becuase I have met alot of customets . Some they were very nice and friendly and I did like the job alot. But unfortunately , the manager was not very nice.so I had resigned that job. At moment I work in supermarket now and I do love its more than old job. first quarter it's very hard fo me because i coudnt find a female visa finally we found a job in the advertising company as secretary which is not good they're not give my 3 months salary but i never lost hope that time I think it's not my lucky year because of what happen, but I never give up I'm just tried to apply online then I'm so lucky, one of multi-company called me and finally i got a new job, I've been 1 year working here in Qatar. I just arrived in London a month ago. It was my first time traveling abroad. For 3 weeks, I lived at my uncle's home at South Woodford, and after that I moved to a flat at Mile End. At the first time, I was afraid that I couldn't communicate with people here because my English was bad. So I decided to learn more about English by taking General English Course at IH London. It was a very good experience because I met new friends there from around the world who had the same objective: IMPROVING our ability in English. I came to UK last year. As soon as I arrived to UK I searched a job especially an accountancy. However I did not get a job because I don't have any other certificates.